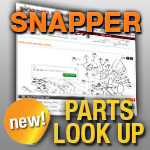 Snapper Tires: Get your replacement Snapper Tires here at Jack's. We have new tires for your Snapper lawn mower and snow blowers, in case you have a flat. Select your type of Snapper tires below.